America, says Pulitzer Prize­-winning writer Chris Hedges in his new book America: The Farewell Tour, is convulsed by an array of pathologies—the opioid crisis, pervasive economic distress, our pornified culture, a plague of suicides, and more—that have arisen out of profound hopelessness, a bitter despair, and a civil society that has ceased to function. In the face of such devastation, what remains of hope? And, as human beings, do we possess the capacity within ourselves to transcend our circumstances? 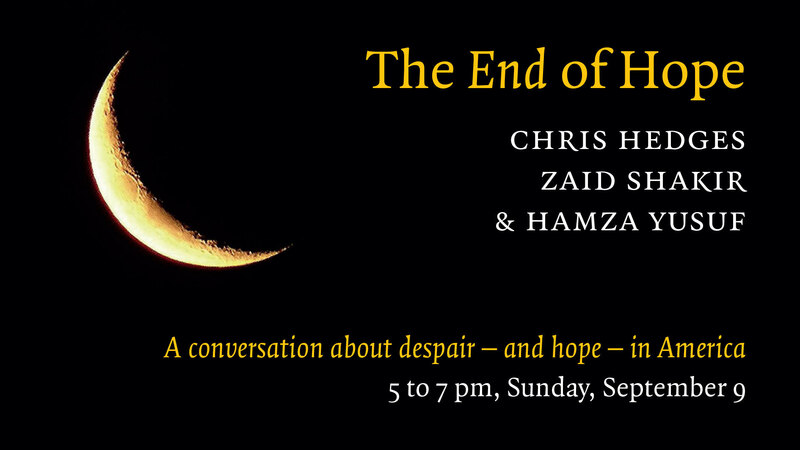 Join Renovatio for what promises to be a thought-provoking conversation with Chris Hedges, Zaid Shakir, and Hamza Yusuf about hope, despair, and the future of our nation. The program begins at 5pm (doors open at 4pm), and the book-signing will be at 7pm, following the program. This event is free; for those unable to attend in person, we will post videos of the event in late September.